The #Occupy movement is spreading, and with good reason. In the western world, and North America in particular, inequality is slowly becoming the norm. And nowhere more so than in the USA. In my view the #Occupy movement is at its core about one thing: Democracy. And though the issues focused on may and should differ from country to country, the one persistent message is clear: Every man, woman and child has a voice and has an equal right to speak, be heard, and be part of society. The problem is that right now, especially in North America, only the rich and powerful get heard while the vast majority get overlooked or ignored. One of the dangers of the #Occupy movement is that it may try to transplant issues from one country to another. This will not only erode the cause itself but make the movement seem ill informed. This is especially important as #Occupy events are ramping up in Canada. 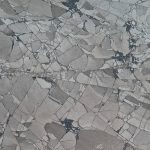 So if you plan on taking part in the events starting on October 15th in Canada, take up the cause of democratic issues we all face in Canada. To help with this I’ve created three posters focusing on three important Canadian democratic issues: Electoral reform, control of telecommunications and cross-media ownership. 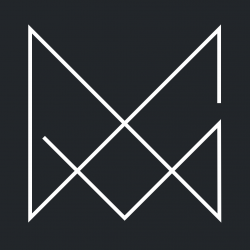 I’ve also attached a short blurb about each of the issues so you can see why they matter and why you should make one of them (or all) your slogan as you #Occupy your city. Canada has an electoral system that has been referred to as a “sham democracy”. The first-past-the-post system does not reflect the popular vote but stacks parliament based on artificial electoral districts and simple majority rules. The result is that parliamentary composition rarely reflects the popular vote. Case in point, the current Harper government. Whereas the Conservatives have a Parliamentary majority of 54.2% they only got 39.6% of the popular vote. In other words, based on popular vote the Canadian government would be a coalition of the NDP, Liberals and the Bloc with the Conservatives as official opposition. 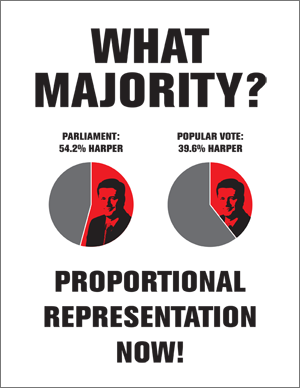 So when Harper claims he has a “strong majority mandate” he is really talking about an artificially inflated mandate based on an antiquated and undemocratic electoral system. Needless to say something must be done about this. The solution is some form of proportional representation, employed by most western nations in the world. This would ensure that the popular vote is represented in parliament. Download the poster in PDF format. JPEG version on Flickr. The CRTC (Canadian Radio-television and Telecommunications Commission ) is the government watchdog and regulatory body for all radio, television and telecommunications in Canada. In other words they are the ones that decide who and what can be aired or sent over the internet and by whom this information is carried. 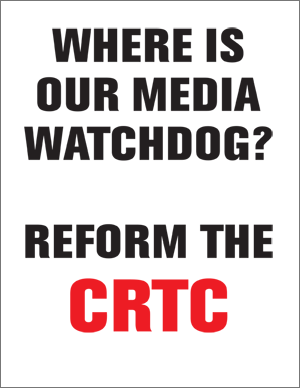 The CRTC regulates the four big Canadian telecoms (Shaw, Telus, Bell and Rogers) who collectively stand for nearly 100% of all broadcasting and telecommunications. The problem with the CRTC is that unlike in other western countries (the USA excluded) their mandate does not include the Canadian people nor consumer rights. The job of the CRTC is to protect the big telecoms from each other. This becomes problematic when you learn that the board of the CRTC is stacked with former heads of the four big telecoms. Because of the weird mandate of the CRTC the four big telecoms can agree among each other to ramp up prices, cut services and lock competition out as long as all of them agree. As a result you, the consumer, gets screwed ever time. Ever wonder why your cell phone bill or cable bill is so high or why you don’t have the same streaming video services they have in other countries? The CRTC is to blame. To solve this and make the telecoms act fairly and treat consumers with respect the mandate of the CRTC must be reformed to include consumer rights. On the topic of the four big telecoms, did you know that almost all Canadian broadcasters are owned by the same telecoms that provide the cable signal in your house? Or that most Canadian news outlets are owned by the same big corporations? In Vancouver, both the major news papers The Vancouver Sun and The Vancouver Province are owned by the same company. The result of such cross-media ownership is that the free word is quashed in favour of corporate interests. When one or a few corporations control the media entirely, the corporate philosophies and political views become the predominant voice in the media landscape. This is further complicated when the broadcasters are owned by the same companies that bring the broadcast signal to your home. 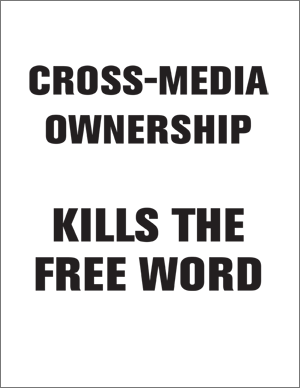 The bottom line is that cross-media ownership results in censorship of opinion and the free word. You see the result in the USA, especially with FOX News, but also in general with the media blackout over the #Occupy movement. And Canada is just inches away from being in that same situation unless the Government starts cracking down on cross-media ownership and passes legislation to prevent it from spreading. If you’re going to one of the #Occupy protests keep this in mind: If you want someone to change their mind you have to make them understand your case first. If you just shout at them, or try to force them, you will get nowhere. Communication is the key to everything.